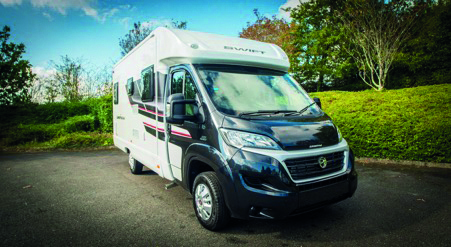 Merit RV, the exclusive New Zealand distributors for the Swift Lifestyle range of motorhomes, will be introducing models from Swift’s 2016 range. Built on the brand new Fiat Ducato, the Swift Lifestyle 664 has a fixed bed layout, with toilet and shower. This is a stunning 4 berth motorhome which is built using Swift Group’s latest SMARTplus construction process. These are a 6.7m long, Warrant of Fitness (WOF) motorhome, with a number of upgraded safety features. The newly-released 2016 Sterling Elite 645 caravan boasts an east/west Island bed, with full rear en suite. Built with the latest Smart HT technology, this has the extremely popular and modern colour scheme. Other 2016 Swift-built units on display will be the Sterling Eccles and Sprite caravan range.